Quilt of Valor honors orthopedic surgeon. Dr. Keith Gabriel is a pediatric orthopedic surgeon at Southern Illinois University School of Medicine. He cares for many of our enrolled children who are affected by things like Scoliosis, Cerebral Palsy and limb deformities. Dr. Gabriel also serves on Specialized Care for Children’s Medical Advisory Board. 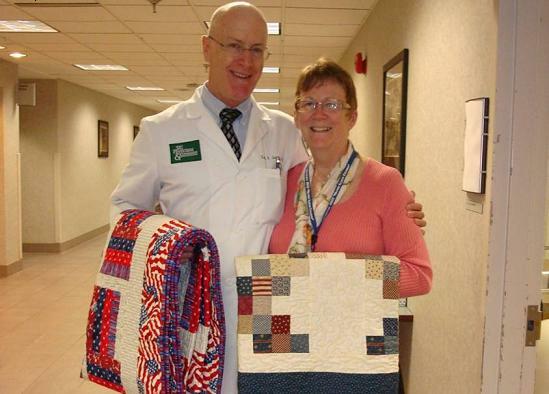 Vail presented two quilts to Dr. Gabriel: one for him and one for his wife, Jane Gabriel, to honor their military service. Dr. Gabriel served in the U.S. Navy as an aviation and general medical officer and an orthopedic (and pediatric orthopedic) surgeon. Jane Gabriel also served in the U.S. Navy. Following 13 years of active duty in the Navy, Dr. Gabriel transferred into the U.S. Air Force Reserves. He has now retired from the military, after total service of 28 years.